Fractured Hard Bodies: Rocky, Rambo and the Expendables. There are summer tours which prepackage former music pop stars in an effort to capture revenue from an aging demographic. The audience is required to suffer through the artists’ latest work before being rewarded with the bands classics tunes. Featuring a cast of former stars, The Expendables, (2010) directed by Sylvester Stallone acts as a summer tour of aged cinematic action heroes from the Reagan era of the 1980’s. The former hard bodies conventions that propelled these stars have been rendered obsolete and been replaced by the more formidable verisimilitude of violence as spectacle. Rocky, (1976) and, First Blood, (1982) directed and starring Stallone spawned a bifurcation in the hard bodies cinema, a movement that relied on fear of potential Fascism “ in the Reagan era, with the resurgence of an increasing militant, vociferous and powerful Right, the Fascist potential forcing itself to recognition,” through its glorification of the male physique. Rocky Balboa, the simpleton character, relies on physical prowess over intellect to pursue his goal. Rocky, as a boxer, is only flesh and blood and thus emotionally subjected to elations and self-loathing as determined by his fallible physical being. This humanistic limitation is visually reinforced as Balboa trains by pounding away on bloodied sides of beef in a meat locker. John Rambo, while initially rooted in physicality, possesses the extension of weaponry which provides him an emotional shield. Rambo gains emotive invincibility though lending agency to the familial object of the material world of knives, guns, explosives and machines. This key differentiation is further magnified in conjunction with political intonations in the Stallone franchise sequel films, Rocky IV, (1985) and Rambo: First Blood Part II, (1985). 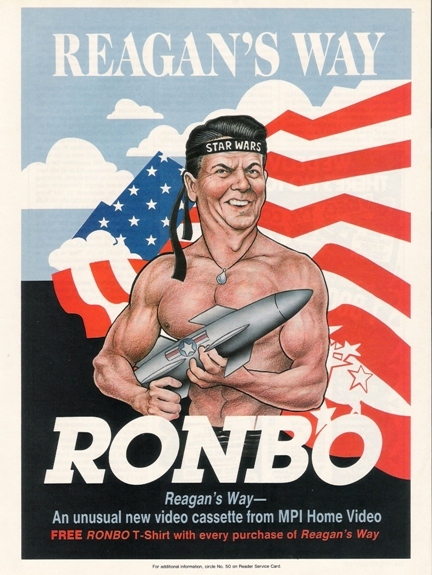 The year 1985 marked a second term of presidency for Ronald Reagan in the United States. It was clear that the cold war had effectively been a victory for the U.S. as evidenced by the dissolution of the Soviet Empire into breakaway republics such as Georgia, Croatia, and Kosovo. Reagan bolstered the U.S. military with a buildup of defense spending while promoting the global influence of democratic institutions and capitalism. Despite its position as leader in a New World Order, the U.S. was still haunted by its defeat in Vietnam; the Stallone films confront this specter of the past through cinematic fantasy. The Regan Era has been described as merging politics with cinema in both cultural and ideological representations. Stallone’s films exemplify this notion in their admonishing the virtuosity of the U.S. soldier, exposing corruption of U.S. government, and vilifying the Russians. Robert Sklar observes the political influences of Rambo, First Blood Part II, “at the deepest levels of ideology and fantasy, The United States refused to concede that it had lost the war in Vietnam; through violence and masculine strength, defeat could be redeemed, rectified, transmuted into victory on other, larger fields of battle.” The victory which Sklar denotes comes through exposing the North Vietnamese regime as a puppet state of the U.S.S.R. If the U.S. defeat in Vietnam resulted from Russian support of North Vietnam, mirrored in the U.S. support of Afghanistan in its war with U.S.S.R., then it stood to reason that U.S. victory in the cold war equated to a protracted victory in Vietnam. While a political analysis of backroom brawls by the U.S. and U.S.S.R. in third world countries, as an alternative to mutual assured destruction, is beyond the scope of this inquiry it may serve as a political foundation for the films discussed. To consider film as a study in symbolism is to invite a clash of modernist predetermined secular beliefs, in combination with one another, in an effort to derive new meaning, “The search for “something else” is the essence of symbolism. In this case, the narrative theme stands for an ideological meaning.” This inquiry seeks to explore enmeshments of the traditional tropes of sexuality and violence as separate entities within cinema. Rocky and Rambo, as physical icons, infuse the spectator with a heightened level of phallocentric empowerment. This grafting of spectator onto character is achieved through scopophilia as “taking other people as objects, subjecting them to controlling and curious gaze.” Narcissistic tendencies within scopophilia harken the spectator to don the mask of the hard bodies’ character “the cinema has structures of fascination strong enough to allow temporary loss of the ego while simultaneously reinforcing the ego.” While the spectator body sits awash in passivity an alternate ego derives pleasure, or envy, through inhabiting the idolatrized human form. Characters, Rocky, and Rambo, are each unified in the embodiment of self-sufficient or rugged individualism further enabling the surrogate hosting for the alternate ego. The hard bodies mask acts as an externalized shield enabling fantasy conquest through possessing super-human strength and endurance. Rambo moves beyond the limitations of flesh and blood as a master of the machines of weaponry. This extension of physicality is visually extricated by a sweeping tilt which begins at the tip of his oversized knife blade then slowly trails up his arm, accentuating a vein bulging biceps muscle, and ending on his doleful facial expression. Rambo shifts the visual pleasure derived from objectifying the female form of “Woman as Image,” to the phallic representation of weapons for destruction. The phallic symbolism may be considered both as sexual or metaphysical. The later of which, is to occupy and displace generating completeness and lack, in accordance with the binary signifier derived in the context of Lacanian theorization. It could be argued that the entirety of Rambo’s character is representational in sexualizing the acts of violence. The doomed relationship with the female lead is transitory and superseded by the broader context of sexual inference. As an example, Col. Trautman, (Richard Crenna) verbally instructs John that he will be “inserted” and “extracted” from the jungle, akin to denotations of the primordial jungle as representing the womb in Heart of Darkness. Once Rambo is deployed he penetrates the enemy encampment and completes his mission with a fiery explosion. This metaphor may have subconsciously appealed to audiences as a gratification model of a sexual-warrior hybrid. Conrad, Joseph. Heart of Darkness. U.K: Blackwood’s Magazine, vol. 10000, February, 1898. Mulvey, Laura. “Visual Pleasure and Narrative Cinema” in Film Theory & Criticism, 7th edition, edited by Leo Braudy & Marshall Cohen. New York: Oxford University Press. 2009. Sklar, Robert. Hollywood in the Age of Reagan, Moodle Posting. College Literature 39, no. 2: 98-109. 2012. (accessed February 3, 2013). Wood, Hollywood from Reagan to Vietnam… and Beyond, 151. Sklar, Hollywood and the Age of Reagan, 345. Wexler, Writing About Violence in a Secular Age, 106. Mulvey. Visual Pleasure and Narrative Cinema, 713. Conrad, Heart of Darkness, 1.